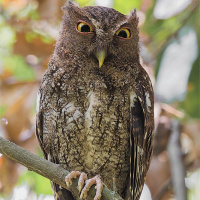 The Chocó Screech Owl is a small owl with short ear-tufts. Distribution: Central Panama to western Colombia and northerwestern Ecuador. Original Description: Hekstra, G.P. 1982. Description of Twenty Four New Subspecies of American Otus (Aves, Strigidae). Bulletin Zoologisch Museum Universteit van Amsterdam. Vol.9, No.7, p. 57. See also: Other owls from Central America, South America, Genus: Megascops. Page by Deane Lewis. Last updated 2015-10-15.